Switching back to the Batman: The Brave and the Bold line, let's take a look at one of the very many Batman figures that are found in the basic lineup - Super Saber Batman! 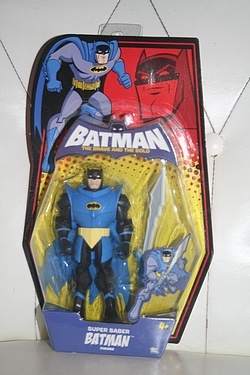 Even though it's a little rough having so many Batman figures if you really do purchase all of the variations, at least this one comes with a huge anime-sized sword as well as some rockin' Batman armor. Click the image below for a few more images of this Batman version from the ongoing Brave and the Bold line!